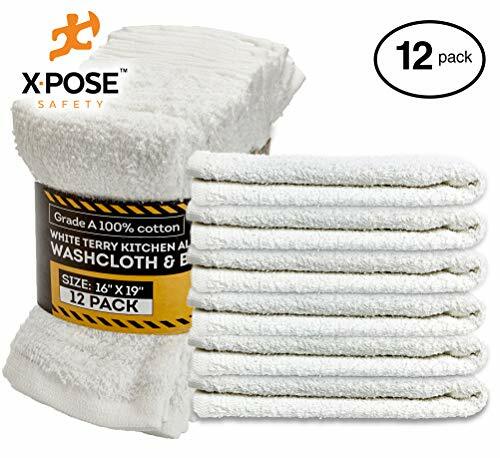 Xpose Safety Bar Mop Towels 12 Pack - Terry Cloth Cotton - Premium Quality Absorbent Home, Kitchen and Restaurant White Cleaning Rags - 16" x 19"
When messes strike, Xpose Safety strikes back with our terry cotton bar mop towels! Now you can get your chores done in a flash and combat against accidental spills, do general house cleaning, and more! Made from thick, highly absorbent cotton, there is no mess big enough that our towels can't handle! Take charge of your space and make sure it's as spotless as you need it to be with our bar towel mops! High grade, strong cotton will be able to eliminate all sorts of spills, dirt, dust, and grime off any surface in your home! Floors, kitchen tops, sinks, tables, walls, ceilings, you name it and our towels will have them looking spiffy in no time. With high absorbency, all wet spots, accidental spills, and leaks can be soaked up and removed in an instance. They are very thick and able to handle tough messes with absolute ease! No matter what size you want your bar towel mops to be, they come in bulk quantities so you will always have a backup to your quick cleaner-upper and a backup to your backup! Keep one in every room of your house so you'll always be ready to tackle any accident - bathrooms, kitchens, bedrooms, garages, and anywhere else! Made from 100% cotton, our bar mop towels are incredibly strong, durable, and thick. Along with powerful absorbing power, you won't find a better bar mop towel anywhere else. Get your Xpose Safety terry bar mop Towels and get your clean on in a better and faster way! ALL-PURPOSE CLEANING TOWEL: Clean up spills, accidents, and all kinds of messes as quickly as possible with our bar mop terry towels that get the job done as quickly as possible. STRONG WHITE COTTON: Made with highly durable cotton, these bar towels are able to handle the toughest messes with ease, and can be washed and reused many times over. HIGHLY ABSORBENT: Don't stress about big spills! Our terry towels are extremely absorbent so a single one can take care of large spills with extreme swiftness, no problem! USE THEM ON ANY SURFACE: Bar or counter top, floors or walls, dinner tables or stools and chairs; wood, granite or plastic; you name it - our rag towels can slide over it and clean. NEAT KITCHEN ASSISTANT: Coming in multiple sizes, pick one that to keep over your arm, tucked in your belt or anywhere as a kitchen towel to quickly dry dishes, or wipe spills.